Hydroacoustics | Illingworth & Rodkin, Inc.
Illingworth & Rodkin has assembled some of the world's best experts in marine acoustics and effects of sound on marine life. 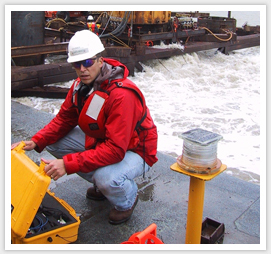 We have been studying underwater sounds from marine construction activities since 2000. Our team of experienced consultants has worked collaboratively with national and regional regulatory agencies to study the impact of industrial noise on underwater ecosystems. The results of I&R's extensive evaluation of industrial noise on natural marine acoustics has led to a better understanding of the impact of manmade sound on underwater environments. In doing so, your aquatic project management team can establish marine mammal safety zones around your build site to minimize or even prevent the harsh environmental effects of underwater construction.